After being forced to become a child soldier in Uganda, Dennis became an outspoken opponent of war atrocities. But his efforts there made him a public target, and he was forced to flee to the U.S. Dennis desperately misses the family and friends he left behind, but fortunately he can see them whenever he wants on Skype. And now, thanks to the Luxembourg-based VoIP service, and filmmaking partner Station Film, he has a digital family portrait to help him focus on the positive. Station Film’s directing duo Nat Livingston Johnson and Greg Mitnick, who go by the moniker Peking, tag teamed on Dennis’ story and others, including the tale of Sarah and Paige—each born with one arm—hemispheres away who bonded with each other using Skype. 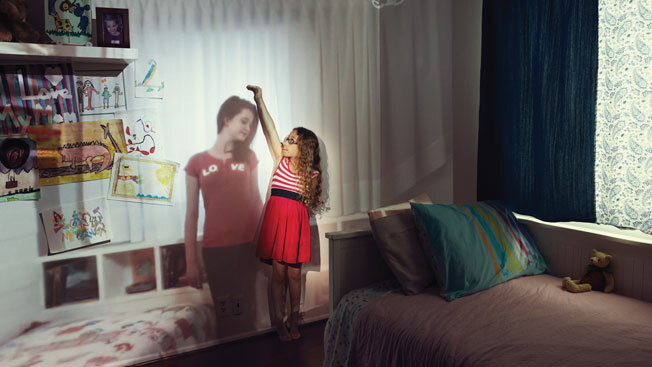 The stories’ participants were asked to pose in a digital portrait with their friends, family (and sometimes animals) by standing next to the projected image of the missing party. Johnson headed up the international efforts, while Mitnick stayed at home to film in the U.S. “Authenticity was the priority,” Johnson explains. All that effort yielded Station Film the Gold honor in Production Series in Adweek's first Watch Awards competition, which celebrates the best work and talent in online video. Interestingly enough, Sarah and Paige’s story was a user-submitted anecdote from a contest Skype was running. The girls didn’t win the main prize, but the companies felt so moved by their story that they facilitated a trip between the teens and filmed their tearful first meeting/reunion. “We’re always inspired by our users’ stories—they’re a part of our DNA and we hear them every day,” says Angie Hill, Skype audience marketing general manager at Skype owner Microsoft.